Can the gay community find new reasons to rally? Jacob Whipple’s spring wedding came off almost exactly how he had planned it for months. The décor, the clothing, the food and the locale all came together perfectly as he and the love of his life celebrated their nuptials. There was one no-show, however— one very important guest who had to cancel the previous November. “The state didn’t show up—but everyone else did,” says Whipple. The “state” in question is California, and Whipple, a Utahn, had planned to have his wedding there because his future spouse was a man. Until the passage of California’s Proposition 8 in November 2008, gay marriage had been legal in the Golden State. The Church of Jesus Christ of Latter-day Saints provided significant backing to help pass the measure, and this hit Whipple especially hard because he’d once been an active Mormon who served an LDS mission and attended Brigham Young University. When he came out as a gay man, however, the church turned him away. 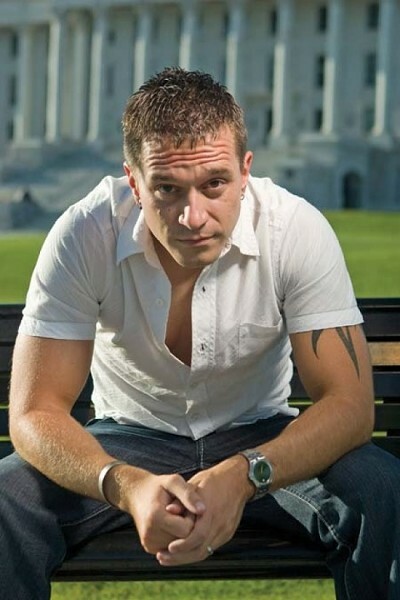 His old life chasing down his new life was what turned Whipple from someone who “was actively gay, but not an activist” into an accidental activist. Without forethought, his outrage became action, and he discovered it was much easier to let his voice be heard than he ever would have imagined. Whipple found out on the morning of Nov. 5, 2008, that Prop 8 had passed. Although he was initially despondent, Whipple became inspired by almost immediate protests at LDS temples in California. So, Whipple contacted the Salt Lake City Police Department, and after finding out how simply he could stage a rally and with no previous experience, he decided to organize one—a mere 48 hours later. Using primarily social media, text messages and e-mail blasts, he spread word of the protest. The gay community quickly seized upon the idea, followed by the local and national media and then the police department, who ordered a large security presence because of the expected crowd size. Regardless of where Whipple ends up in the hereafter, 3,000 people showed up to his protest. It was an astounding number, given that the whole thing was thrown together by word of mouth in a couple of days by a virgin organizer. Protesters clogged downtown streets and essentially surrounded Temple Square, carrying signs and shouting slogans. Through it all, Whipple marveled that, “Even in red-as-hell Utah,” the crowd not only included the lesbian, gay, bisexual and transgender (LGBT) community, but also straight and even LDS supporters. The community response culminated in a party called “Buttars-palooza,” where the hundreds who turned out showed, in a humorous way, the gay community and its allies would not be passive. Without the street protests as a drawing card, it became difficult to turn the November momentum into any substantive legislative victories. The statement by the LDS Church momentarily gave the gay community a glimmer of hope. But during the legislative session, the church—which refused requests for an interview for this article—never specifically supported the Common Ground Initiative. Without the church’s vocal support, the bills had no chance on Capitol Hill. Although none of those bills came close to passing, their mere introduction amounted to small victories because they actually received committee hearings. For political insiders and longtime activists, simply getting a hearing—even if one of them was with a Senate committee that included Buttars and other strongly conservative Republicans—was important. But for the casual observer, it could easily be seen as proof that change would never happen legislatively, and it could have sapped motivation to continue the fight. It is not only frustrating on a state level. On the national level, the election of President Barack Obama and large Democratic majorities in both houses of Congress have failed to repeal the “Don’t ask, don’t tell” policy in the military or the Federal “Defense of Marriage Act” (DOMA), which states that marriage can only be between a man and woman. Progress is being made, but it is slow, with the biggest step being a mid-August statement from Obama that he does not support DOMA. The energy generated by the November 2008 Proposition 8 rallies continued to wane—and it did not help that Mike Thompson, executive director of Equality Utah, pulled up stakes and moved to San Francisco in summer 2009. The group is currently in the process of finding a new leader. Then, in July, a 3rd District Court ruling refused to honor the parenting rights Gina Edvalson had tried to create through a contract with her former lesbian partner. That same week, two gay men, Derek Jones (a City Weekly sales rep) and his boyfriend Matt Aune were detained and removed from the LDS Church-owned Main Street Plaza after, the men said, one kissed the other on the cheek. The LDS Church argued the men were doing more than innocently kissing, and their arrests had nothing to do with their sexuality. The two men were cited for trespassing, although charges were later dropped. Just like in November, a protest was planned, and once again it was organized quickly by alerting people electronically. 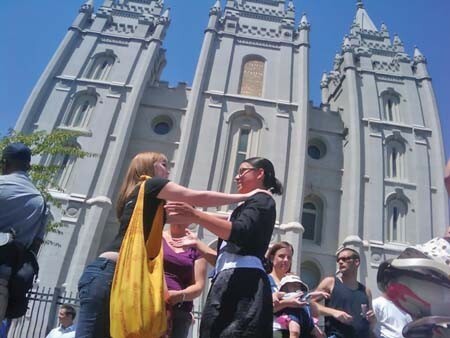 Instead of a march, this time a kiss-in was to be held on the public right-of-way next to the LDS Temple Plaza. It seemed like the perfect moment for the LGBT movement to regain some momentum, since the same organization that strongly advocated for Prop. 8 in California was now detaining gay men in Salt Lake City. Except that the end result was about 100 people showed up. Maybe it was inevitable. It’s hard to expect people to maintain a revolutionary fervor 365 days a year when they have jobs and families. Maybe it’s simply that things have moved from the protest stage to the more nittygritty stage requiring lower-profile activities like holding town-hall discussions about workplace discrimination or volunteering to work on city council races. Maybe it’s because expectations have risen so dramatically over the past few years that the gay-rights fight is no longer about defense but is now focused on gaining rights. Maybe the conversation about LGBT issues has evolved to the point where fever-pitch emotions are no longer needed. Maybe there’s a sense of inevitability about the way things will end up in the long run. Or, maybe it was simply due to the early start-time for the kiss-in. Some 10 months after the heady days of November, the question arises: Where does Utah’s LGBT community stand as a result of what happened, and where is it headed?